Whenever the legislature delegates a duty to another elected body or agency, hold on to your wallet. The tax we pay on gas is no exception. 2010 legislation authorizing a “fuel tax swap,” added over $1 billion to the state general fund and improved cash flow. Sold as a way to keep gas prices neutral at the pump, by “swapping” some of the sales tax on gasoline to “excise” tax John Q. Public, and local governments that counted on their share of the sales taxes, took a hit. Cash strapped, California’s general fund was precariously balanced after the 2008 crash, so in 2010 state finance gurus contrived another way to add more tax receipts to state coffers. Sales tax on gasoline is reserved for local roadway improvements; fuel excise tax may be used for state transportation or debt service needs. Simply stated, excise tax is a flat rate paid by the merchant to the state before the goods can be sold. The merchant adds the excise tax to the cost of his goods, and we, the consumers, pay sales tax on the total price. 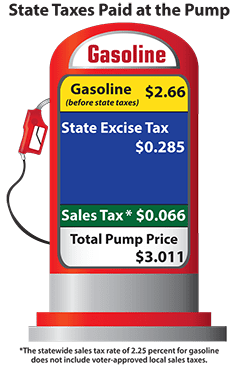 This year the three-year rolling projection showed the excise tax should decrease 7.5 cents, or from nearly 36 cents to 28.5 cents per gallon. The final decrease will be 6 cents, a disappointing result, but a tax cut nonetheless. The legislation mandated that the five-member State Board of Equalization implement the annual projected “revenue neutral” rate of tax we pay at the pump, by annually adjusting the excise tax. I would have preferred to approve the 7.5 cent cut. However, the 6 cents reduction received a full public hearing and was an easy call. But there is more. This year, per AB 32, the state’s Global Warming Solutions Act of 2006, the Air Resources Board is authorized to begin adding a carbon tax to the price at the pump. While initially 10 cents, it could be higher in future years; we will pay sales tax on that increment as well. While the net benefit to consumers of a reduction in excise tax and increase in cap and trade fee is slightly negative, had the price of oil not decreased so dramatically, it could have been a much worse. As long as the OPEC countries, with government controlled oil production (rather than private market producers) continue to create a glut of oil, state taxes and fees can remain hidden. However, it does not require much economic sophistication to know that as private companies reduce exploration because it is no longer profitable to build new wells or continue fracking, the glut will diminish and the price of oil will increase. As for renewables saving the day, as of 2013 only 12.9% of the United State’s energy stemmed from renewable sources. The lesson learned from the swap and the projected excise gas tax decrease is that what the government gives, it can take away. The swap could always be unwound, but I wouldn’t hold my breath. When a legislative body delegates its authority to tax and assess to another entity, secure your wallet.